Carter Page Tells House Intel Panel Who He Talked To About Russia Contacts The disclosure from the former Trump campaign adviser increases the pressure on the attorney general ahead of a hearing scheduled for next week before the House Judiciary Committee. Carter Page, former foreign policy adviser for the Trump campaign, speaks to the media after testifying before the House Intelligence Committee last week in Washington, D.C.
Former Trump campaign foreign policy adviser Carter Page told a number of his campaign colleagues and supervisors about his dealings with Russians, he told members of Congress last week. One of them was Jeff Sessions, then an Alabama senator and early Trump endorser and now the attorney general. Sessions has denied he was aware of anyone in the campaign communicating or dealing with Russians who were interfering with the election. Page's disclosure increases the pressure on Sessions ahead of a hearing scheduled for next week before the House Judiciary Committee. Democrats have howled about recent news in the Russia imbroglio that appears to contradict Sessions' long-standing claims that he didn't know about the overtures from Russia to people in the Trump campaign. The new details come from Page's closed-door testimony last week with the House Intelligence Committee, which is investigating Russia's interference in last year's election. 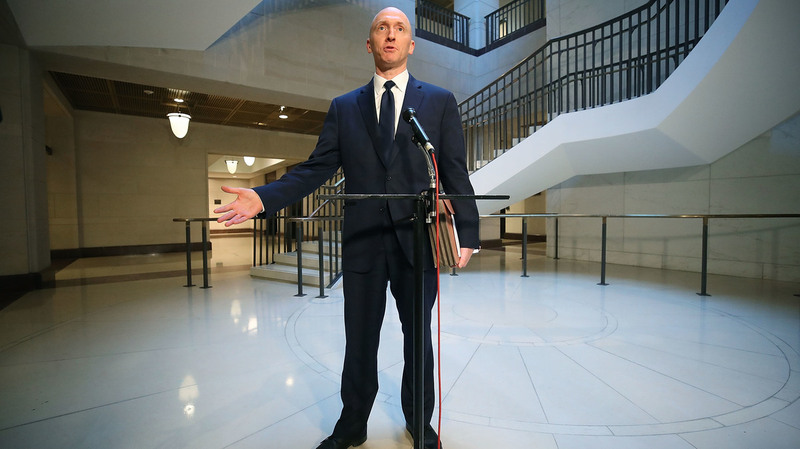 The panel reached an agreement with Page to release the transcript of his interview to the public, and the committee posted the transcript online late Monday. Page's comments provide the latest confirmed contacts between members of the Trump campaign and Russians during the presidential race. He is at least the second member of the foreign policy team contacted by Russians with offers of help or meetings. Another adviser at the same time that Page joined the campaign, George Papadopoulos, has pleaded guilty to lying to the FBI about his contacts with Russia. Papadopoulos and Page both served as members of candidate Donald Trump's foreign policy committee. Papadopoulos also told his superiors on the campaign that he was being offered "dirt" on Democratic rival Hillary Clinton and "off the record" meetings with Russian leaders — which, according to court documents, he was encouraged to pursue. The case of Page, an energy consultant and graduate of the Naval Academy, has attracted scrutiny since he was named an adviser to the campaign in March 2016. For more than a year, questions have swirled about a trip Page made to Moscow in July 2016 during which he delivered a commencement speech at the New Economic School, a Moscow university. Page then traveled back to Russia after Election Day last year. Page addressed some of the questions about those trips in more than seven hours of testimony last week to the House committee. Page said that before heading to Moscow, he informed then-campaign manager Corey Lewandowski along with communications director Hope Hicks and J.D. Gordon, who was managing the candidate's national security team. Hicks is now the White House communications director. For months, Page has denied meeting with Russian government officials while in Moscow. But according to the transcript, he told lawmakers that he did indeed speak with members of the Russian government and state-owned businesses, including Deputy Prime Minister Arkady Dvorkovich. The two men had a brief interaction at the commencement ceremony, where Dvorkovich also spoke, Page said. Their conversation, he told investigators, was not about coordination with Russia on the campaign, but largely limited to an exchange of pleasantries. Page offered the Trump campaign a "readout" about his trip, including the discussions with Russian officials. He wrote to Gordon and Tera Dahl, a former columnist at Breitbart, that he would send them a memo "regarding some incredible insights and outreach I've received from a few Russian legislators and senior members of the presidential administration here." The House panel's top Democrat, Rep. Adam Schiff of California, cited a memo Page sent campaign officials that quoted Page as writing "in a private conversation, Dvorkovich expressed strong support for Mr. Trump and a desire to work together toward devising better solutions in response to the vast range of current international problems." Page played down those comments, telling Schiff that his insights were drawn from listening to Dvorkovich's speech and public statements, and from reading the Russian press and watching Russian television. Page also acknowledged to members of Congress that he has had at least four meetings with the FBI related to the Russia investigation. He denies any wrongdoing and says that he has been the subject of a witch hunt. President Trump also calls the Russia investigation a witch hunt and has repeatedly said there was no collusion between his campaign and the Kremlin. A previous version of this story incorrectly gave Arkady Dvorkovich's first name as Andriy.